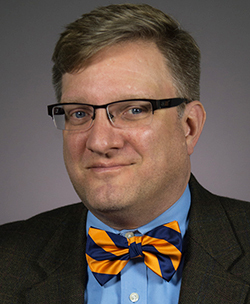 Charles E. Morris III, professor and chair of the College of Visual and Performing Arts’ Department of Communication and Rhetorical Studies, delivered the 2016 Kurt Ritter Lecture at Texas A&M University. Established in 2009 and named after the founder of the Department of Communication at Texas A&M, the Kurt Ritter Lecture is an annual lecture delivered to the faculty, graduate students and undergraduate students in the department and serves as the centerpiece of its yearly colloquium series. This year, Morris’ lecture, “Queering Rhetorical Interiors,” served as the keynote address for the Gender & Citizenship Conference hosted by the department Feb. 18-21. Morris’ research concerns rhetorics of GLBTQ history and memory; his most recent book is “An Archive of Hope: Harvey Milk’s Speeches and Writings,” published by University of California Press in 2013. For two decades he has been a regular contributor to the “Quarterly Journal of Speech,” and he is co-founding editor of “QED: A Journal in GLBTQ Worldmaking” (Michigan State University Press). For his queer work he has twice been the recipient of the Golden Monograph Award, as well as the Randy Majors Award for Distinguished Scholarship in LGBTQ Studies, from the National Communication Association.